Effect on SACC: Species currently placed in Myrmeciza will be assigned to Myrmeciza and eleven other genera, five of which (Akletos Dunajewski, Myrmelastes Sclater, Myrmoderus Ridgway, Myrmophylax Todd, and Sipia Hellmayr) are resurrected, and six of which (Ammonastes, Ampelornis, Aprositornis, Hafferia, Poliocrania, and Sciaphylax) are newly described. Species currently placed in Schistocichla will be reassigned to Myrmelastes. Background: The history of Myrmeciza is characterized by decades of uncertainty and controversy as outlined in Isler et al (2013). Recent authors have consistently expressed doubt that Myrmeciza represented a monophyletic group, but until recently the basis for a revision was unavailable. New Information: Results from a subset of taxa from a densely sampled molecular phylogeny (218 of 224 species) of the Thamnophilidae (Isler et al. 2013, Figure 1) provided high support that Myrmeciza is not monophyletic and that its members are located in three of the five tribes of the subfamily Thamnophilinae proposed by Moyle et al. (2009). Morphological, behavioral, and ecological character states of Myrmeciza species and their closest relatives within each tribe were compared to establish generic limits. Finally, results were arrayed to test for consistency and provide a benchmark for replication. Additional perspective was provided by examining recommendations in a time-calibrated species-level phylogeny of the entire family (Bravo 2012). Figure 2. Time-calibrated tree showing relative ages of former members of Myrmeciza. Bars at nodes indicate the 95% highest posterior density for the inferred divergence time estimates. This is Figure 3 from Isler et al. (2013) with the Akletos revision. Because the number and type of supporting traits is greater for some generic recommendations than others, we have subdivided this proposal into seven parts and have provided alternatives that the committee might wish to consider for some of them. More extensive discussion of the basis for our recommendations can be found in Isler et al. (2013). Table 1 below provides a summary of recommended genera and species and suggests interim placement of each genus in the current SACC sequence pending a comprehensive revision of the Thamnophilidae. Proposal 628B. Recognize the genus Sciaphylax. The same is true for the comparison ("B" on Figure 1; Figure 2) between the pair of "Myrmeciza" species located in the tribe Pithyini with their closest relative, the "tyrannina clade" of Cercomacra which has recently been recognized as a distinct genus, Cercomacroides (Tello et al. 2014). Proposal 628C. Recognize the genus Myrmoderus. The remaining "Myrmeciza" species are located in the tribe Pyriglenini. Multiple traits distinguish the four species in this genus, which constituted a well-supported clade in the phylogeny ("C" on Figure 1; Figure 2). Proposal 628D (option 1). Recognize the genera Poliocrania, Ampelornis, and Sipia. The phylogeny identified a well-supported clade ("D" on Figure 1; Figure 2) with exsul at the base and including griseiceps and an internally unresolved subclade that includes palliata, laemosticta, nigricauda, and berlepschi. The difficulty is that exsul is similar in morphology and behavior to the subclade, as suggested earlier by Robbins and Ridgely (1991), but differences in multiple traits between griseiceps and other members of the clade indicate that griseiceps should not be placed in the same genus as others in the clade. If griseiceps is placed in a monotypic genus, exsul also has to be placed in a monotypic genus if a paraphyletic genus is to be avoided. Nest architecture differences between exsul and the subclade support their separation. Proposal 628D (option 2). Recognize the genera Ampelornis for Myrmeciza griseiceps and Sipia for M. exsul, M. berlepschi, M. nigricauda, M. laemosticta, and M. palliata. Not recommended. This option creates a paraphyletic genus. Proposal 628D (option 3). Recognize the genus Sipia for Myrmeciza exsul, M. griseiceps, M. berlepschi, M. nigricauda, M. laemosticta, and M. palliata. Not recommended. This option creates a genus diagnosable only geographically that includes species whose traits are inconsistent as compared to other thamnophilid genera. Proposal 628E (option 1). Recognize the genera Sclateria and Myrmelastes. 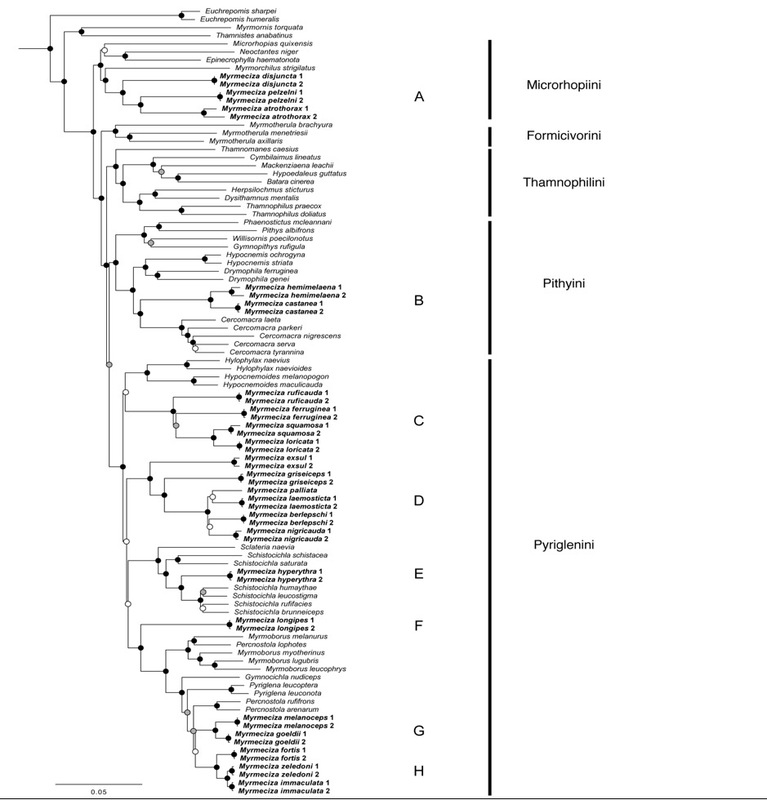 The phylogeny identified a well-supported clade ("E" on Figure 1; Figure 2) with Sclateria naevia at the base and including Myrmeciza hyperythra imbedded within subclades that include Schistocichla schistacea, S. saturata, S. humaythae, S. leucostigma, S. rufifacies, and S. brunneiceps. Although not previously recognized (perhaps because of its larger size), multiple plumage and behavioral traits of M. hyperythra are consistent with those of Schistocichla species. The unique morphological and behavioral characteristics of Sclateria naevia that led to its earlier placement in a monotypic genus are sufficiently distinct to maintain Sclateria as a monotypic genus. Proposal 628F. Maintain Myrmeciza as a monotypic genus. Myrmeciza longipes holds a well-supported position ("F" on Figure 1; Figure 2) at the base of a clade containing the remaining genera within the tribe Pyriglenini, from which it differs in multiple traits. Future studies may find that more than one species is involved. Proposal 628G (option 1). Maintain Percnostola and recognize the genera Akletos and Hafferia. Traits distinguishing genera other than Myrmeciza in the final clade are fewer than the preceding clades and almost entirely confined to morphology, yet the clade includes well-established genera such as Myrmoborus and Pyriglena. The principal challenge involves the Percnostola, immaculata, and melanoceps subclades ("G" and "H" in Figure 1). A sister relationship between any of them is not strongly supported so we currently have a polytomy. Future analysis with additional data can either support: (a) a sister relationship between Hafferia and Akletos or (b) a sister relationship between Percnostola and either Hafferia or Akletos. Given the uncertainties, we wanted to avoid lumping Akletos and Hafferia into one genus that could become paraphyletic. Our preferred options are either to treat them as separate genera (628G option 1) or to merge them into Percnostola (628G option 3). With either of these, no matter what the final topology will be, no taxon can become non-monophyletic. On the other hand, if Percnostola and Hafferia + Akletos are placed into two genera (628 option 2), scenario (b) would render a paraphyletic genus. We recognize that, despite this possibility, option 2 might be considered a more conservative approach. Given the choice of placing them in the same genus as the morphologically dissimilar Percnostola or recommending three genera, the latter was deemed consistent with the morphological distinctions currently distinguishing other genera in the Pyriglenini. Note that subsequent to publication, it was brought to our attention that the proposed name for one of the recommended genera, Inundicola, was a junior synonym of Akletos, and a correction has been made (Isler et al. 2014). Proposal 628G (option 2). Maintain Percnostola and place Myrmeciza melanoceps, M. goeldii, M. fortis, M. zeledoni, and M. immaculata in Akletos. Not recommended for reasons discussed under option 1. Proposal 628G (option 3). Recognize the genus Percnostola for P. rufifrons, P. arenarum, Myrmeciza melanoceps, M. goeldii, M. fortis, M. zeledoni, and M. immaculata. Not recommended. This option creates a genus that includes species whose traits are inconsistent as compared to other thamnophilid genera. Proposal 628G (option 4)*: Recognize Gymnocichla but lump all of Percnostola, Akletos and Hafferia into Pyriglena. Not recommended. Same basis as option 3. Proposal 628G (option 5)*: Lump all of Gymnocichla, Percnostola, Akletos and Hafferia into Pyriglena. . Not recommended. Same basis as option 3. Bravo, G.A. 2012. Phenotypic and niche evolution in the antbirds (Aves, Thamnophilidae). Ph.D. dissertation. Louisiana State University. Baton Rouge. Donegan, T. M. 2012. Geographical variation in Immaculate Antbird Myrmeciza immaculata, with a new subspecies from the Central Andes of Colombia. Bulletin of the British Ornithologists’ Club 132: 3–40. Isler, M. L., G. A. Bravo, and R. T. Brumfield. 2013. Taxonomic revision of Myrmeciza (Aves: Passeriformes: Thamnophilidae) into 12 genera based on phylogenetic, morphological, behavioral, and ecological data. Zootaxa 3717 (4): 469–497. Isler, M. L., G. A. Bravo, and R. T. Brumfield. 2014. Inundicola Bravo, Isler, and Brumfield 2013 is a junior synonym of Akletos Dunajewski 1948 (Aves: Passeriformes: Thamnophilidae). Zootaxa 3779 (3): 399–400. Robbins, M. B., and R. S. Ridgely. 1991. Sipia rosenbergi (Formicariidae) is a synonym of Myrmeciza [laemosticta] nigricauda, with comments on the validity of the genus Sipia. Bulletin of the British Ornithologists’ Club 111:11-18. Tello. J. G., M. Raposo, J. M. Bates, G. A. Bravo, C. D. Cadena, and M. Maldonado-Coelho. 2014. Reassessment of the systematics of the widespread Neotropical genus Cercomacra (Aves: Thamnophilidae). Zoological Journal of the Linnean Society 170:546–565. "… Notably, ellisiana [a synonym of immaculata] was originally described in Pyriglena by Sclater (1855) so such a treatment would not be novel. Moreover, M. goeldii shares the bright red eye of Pyriglena and Percnostola rufifrons (others in the clade possess red-brown or rufous to brownish irides) and all of the Pyriglena / Gymnocichla / Myrmeciza clade have fairly uniform black male and brownish female plumages, with some species having white interscapular patches and wing-covert fringes. Songs of Pyriglena and Gymnocichla are similarly structured to those of Myrmeciza, involving repeated notes at more or less the same frequency and with a similar note shape to zeledoni and macrorhyncha (e.g., Fig. 5). " My recent separate revision of Myrmeciza contains a lot of relevant data for this group that was not used or cited by Isler et al. (2013). Isler et al. (2013) instead rely heavily on various morphometric data based on a smaller sample, but present only averages (and no standard deviations, maxima or minima), so it was not possible to assess their diagnosis. I therefore took the dataset on which Donegan (2012) was based, plus my unpublished mist-net data for Gymnocichla and Pyriglena, to consider the extent to which their assertions were supported by my data. I then considered each claimed diagnostic feature of genera set out in Isler et al. (2013) to identify those that are unique to their proposed genera in this clade. "Dome shaped nests" are mentioned for each genus in diagnosis but do not diagnose within this group so are not discussed further. Extensive bare crown of male. Note "Hafferia" have bare skin which is less extensive. Shared with female "Hafferia" immaculata, so not diagnostic. Reflects the vernacular name "fire-eye" but not diagnosable. As noted in Donegan (2012) and the field guide literature, Percnostola and "Akletos" goeldii have red eyes. Gymnocichla have red irides and others in the group have variously dark red, chestnut and brownish irides. There may be minor differences in shade of red between the proposed genera. Gymnocichla has (smaller) white interscapular patches. Diagnosable, but note immature males in a generally female plumage state of immaculata and zeledoni of "Hafferia" can show female-like plumages with black tails. My mist-net data for one species in this genus is consistent. Claimed bill length/total length ratio differences may follow, but because body length data is so variable depending on specimen preparation techniques, I do not collate or have such data to compare. These overlap in my data set with the "Hafferia" (immaculata) group, as noted by Isler et al. (2013). Tail length/wing length ratios, distinguishable from some genera not including "Akletos". For tail length/wing length, my data of "Akletos" melanoceps is consistent in not overlapping with Pyriglena. However, this feature is not diagnostic as against all taxa (as noted by Isler et al.). For M. immaculata macrorhyncha ("Hafferia") this ratio overlaps with Pyriglena. "Hafferia" fortis is also grey, but darker. This and other measurements only asserted as diagnosable against Pyriglena. Specialisation may be diagnostic, but "Hafferia" fortis and some other species in this clade have a broad ecological range. Male black (as several other genera) or greyish black. "Greyish black" only marginally diagnostic from "grey" for Percnostola. From Pyriglena (only) in having bare periorbital patch and no interscapular patch. Not diagnosable from all genera, as noted. From "Akletos" (only) in "long tail" and "shorter wings" and "tail length/wing length ratio". This difference is only supported using my data set if particular populations or species are compared but contradicted by my data when all species are considered. Tail length is diagnostic between "Akletos" melanoceps and (most but not all) members of the immaculata/zeledoni group (from among "Hafferia"). However, tail length overlaps substantially between both species of "Akletos" and "Hafferia " fortis, so is not diagnostic (Donegan 2012, Appendices 2 &4). Wing length also overlapped for almost all species in the "Akletos" and "Hafferia" groups, so is not diagnostic. Wing/tail ratio overlapped to a large extent between both "Akletos" and "Hafferia" fortis so is not diagnostic. These differences presumably result from Isler et al. (2013)'s smaller sample (245 specimens from 62 species across all of the broad ex-Myrmeciza and relatives) compared to mine (283 specimens of just 5 species all in "Hafferia" and "Akletos"). Diagnosable from other groups "except Pyriglena and Hafferia" by plumage. As M. immaculata, Pyriglena and Gymnocichla. As Gymnocichla and "Hafferia" immaculata. Differs from Pyriglena (only) in having bare periorbital patch (difference from latter in interscapular markings not mentioned). Incorrect: "Akletos" goeldii lacks any visible bare skin. Consistent with my data but not differing from all other genera in the group in this feature. From "Hafferia" in shorter tail, longer wing and wing/tail ratio. My data contradicts this, as set out above. Gymnocichla: more extensive bare skin on head. Pyriglena: shorter bill, more extensive interscapular patches. Percnostola: lighter grey males, specialism to sandy soil habitats. “In relation to the latter two genera combined, an "absence of strong white markings of particular shapes or patterns on the wings" could perhaps be studied further. Although claimed biometric differences are not supported by my larger data set, vocal data in Donegan (2012) show the latter two groups to be diagnosable by the maximum acoustic frequency and note shape of male songs, multi-note calls and single note calls. “Although diagnostic characters are elusive, the general size, songs, calls, feeding habits, general plumage patterns, nesting and biometrics of all these proposed split genera are remarkably consistent (see opening quoted passage). In Donegan (2012, Fig. 5) the similarly structured songs of Pyriglena, "Hafferia " and "Akletos" are illustrated. All these proposed genera give songs consisting of repeated notes of a more or less similar and non-variable shape, as well as grating "multi-note calls" (Fig. 7 of Donegan 2012) which vary only in note shape and frequency between species. I would therefore disagree that Proposal 628G (Option 3) "creates a genus that includes species whose traits are inconsistent as compared to other thamnophilid genera". “Based on Isler et al. (2013)'s molecular data, Pyriglena, Percnostola, "Akletos" and "Hafferia " are also the youngest of all the clades proposed for species rank. Gymnocichla is borderline compared to other genera. “Defining genera is often a subjective exercise. However, I would personally want to see more than the above in terms of "real world" differences (or a pressing need to avoid lumping nice, cohesive genera: cf. the recent Thryothorus proposals and Henicorhina/Cinnycerthia) to support recognising all these genera in the absence of deeper molecular divergence. John Boyd's "taxonomy in flux" website independently also lumped "Hafferia " and "Akletos" for similar reasons. “In my view, the most important criteria for genera should be (in order of importance): (i) assured long-term monophyly and stability; (ii) lack of damage to existing long-standing treatments; (iii) "real world" differentiation (morphological, ecological, vocal); and (iv) branch length. Isler et al. (2013) in this clarified proposal have made good arguments for Option 2 not being a sensible approach due to risks of paraphyly. Option 1 to my mind involves unnecessary and unsupported over-splitting: it is based only on lighter grey males and habitat preferences of Percnostola, claimed biometric differences that are not supported with a larger data set and previously unmentioned vocal differences. At the other end of the spectrum, Options 4-5 would result in instability through lumping long-recognised genera Percnostola and/or Gymnocichla. As a result, in my view, Proposal 628G (Option 3) (lumping Percnostola, "Akletos" and "Hafferia") would be the most supportable approach. We need to change the names of the "Akletos" and "Hafferia" groups anyhow. This treatment results in three monophyletic, morphologically diagnosable genera, with branch lengths more similar to other ex-Myrmeciza. The resulting genera are then all diagnosable in the real world (Pyriglena: short-billed, broader interscapular patches; Gymnocichla: uniquely extensive bare skin; Percnostola: none of the above). A – Yes; B – Yes; C – Yes; D – Option 1 Yes; E – Option 1 Yes; F – Yes; G – Option 1 Yes – this allows for adjustment if other data come forth. “628a. Yes, although an argument could be made for treating this clade as a single genus and if one ascribed to that philosophy and applied consistent treatment then some of the other proposals would not result in a multitude of genera. All subjective. 628b. Yes, but as in above, this clade could be treated as a single genus. 628d. Yes to option 1. 628e. Yes to option 1. Comments from Nores: “Note: I am responding to this proposal, based almost exclusively on the molecular analysis and, except some strictly necessary cases, avoiding creating new genera. A. NO. I prefer to include the three species of this clade in a single genus: Myrmophylax. B. YES. C. YES D. YES, option 3. E. YES, option 2 F. YES G. YES, option 3. Comments from Stotz: “A NO Obviously these 3 species have to be moved out of Myrmeciza. However, I am okay with recognizing the clade as a unit. They would be called Myrmophylax, I think. D Option 3 We lived for a long time with griseiceps and exsul in Myrmeciza, I think that their differences from the other four can be survived. While the proposal says that the only thing that diagnoses the clade is geography, it does seem like geography means something here. G – Yes to Option 5 – According to the reasons given by Donegan. Akletos and Hafferia not seem to be diagnosable a level comparable to other genera. Comments from Pérez-Emán: “A complex proposal that relies somehow in the subjectivity behind how we define a genus. 628A: YES based on genus diagnosability. Lumping everything would result in a highly heterogeneous taxon. 628C: YES. Consistent with morphological and behavioral characters indicated by Isler et al (2013). 628D: Option 3. I would consider all species in one genus, Sipia. It makes sense geographically and we do not have to split this group of related species into three genera. M. griseiceps is the most divergent species both morphologically and vocally but these differences could be considered species level differences. This is a Tumbesian endemic and many of these restricted species are relatively divergent to their closest relatives (e.g., Hemispingus piurae, Basileuterus trifasciatus). “A. YES; certainly disjuncta warrants its own genus, and although I am less enthusiastic about splitting atrothorax and pelzelni; branch lengths do support this as well. D. YES to option 1, on the basis of avoiding paraphyly and favoring diagnosability. E. YES to option 1: Sclateria seems sufficiently divergent to warrant its own genus. F. YES. Longipes is definitely an outlier in this group. Comments from Remsen: “As noted by others, resurrection and creation of monotypic genera seems the only solution for making our classification follow the new phylogenetic results. For many decades, the polyphyly of Meyer de Schauensee’s Myrmeciza has been predicted by field people, but I don’t think anyone predicted it would be THIS bad. “A. 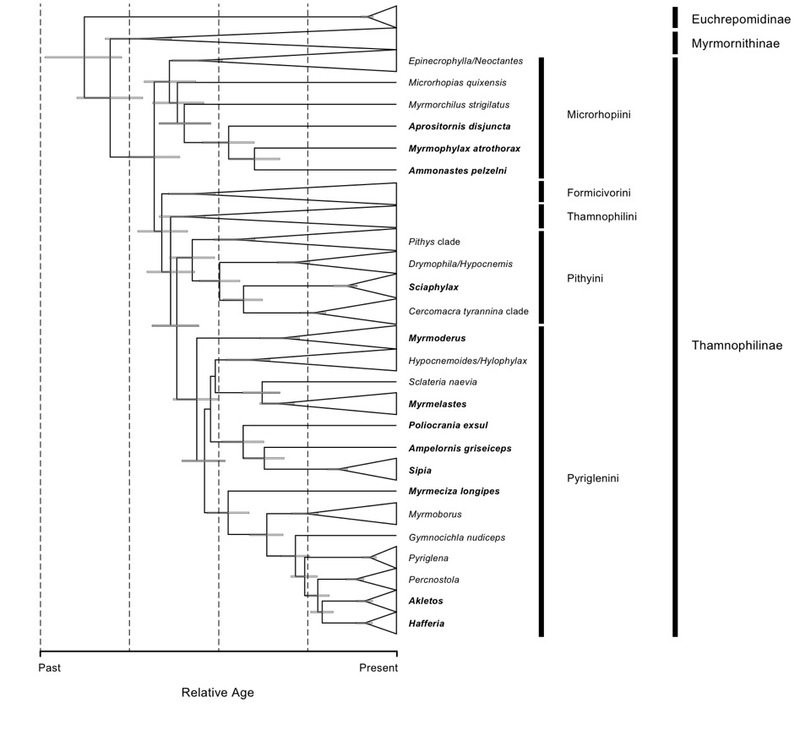 YES for reasons stated in the proposal: lack of morphological diagnosability in an expanded Myrmophylax and comparative lineage age as indicated by branch lengths. Those who vote no on A need to justify why nodes as deep as these in the tree should unite taxa in a single genus, in contrast to many other traditional genera with much shallower nodes. That the three are treated in 3 monotypic genera signals that these are three old, highly divergent lineages. “A. YES. From both vocal and ecological (behavioral + habitat) perspectives, strigilatus, disjuncta (especially). and pelzelni are each unique and not clearly close to anything else. I think that atrothorax is most remarkable for its lack of unique characters, and hence, also does not clearly align with any other member of this clade. Morphologically, atrothorax and pelzelni are closest to one another in male and female plumages, but there just isn’t that much there to justify lumping these disparate taxa into a single genus that would essentially represent an unrecognizable hodgepodge. D. Option 1. YES. Option 2. NO, due to the paraphyletic genus that would result if exsul is retained with the others, without also retaining griseiceps. Option 3. NO. I just think that griseiceps is too different from the others, in virtually every respect. Once we commit to keeping griseiceps in a monotypic Ampelornis, we’re forced into recognizing Poliocrania and Sipia. E. Option 1. YES. Option 2. No. G. Option 1. YES. This one presents the toughest call for me. I would agree that these three genera are somewhat weakly defined, although species-pairs within each (e.g. arenarum-rufifrons, immaculata-zeledoni, goeldii-melanoceps) make intuitive sense based on morphology, voice, and habitat/ecology. On the other hand, taken collectively (Option 3), they form a group that is also ill defined and somewhat squishy in my opinion. Option 5 may be better (there are lots of vocal and behavioral similarities that transcend current generic lines and those proposed in Option 3), but I have always preferred recognizing tighter, more internally cohesive genera to more inclusive, amorphous ones, and I find it difficult to get rid of Gymnocichla and the currently internally cohesive Pyriglena (sensu stricto). While loudsongs of nudiceps, immaculata and some others are suggestive of those of Pyriglena (as currently constituted), I don’t think that any of the other species under discussion can approach leuconota (which, I’m pretty certain, contains more than 1 good biological species), leucoptera and atra in the complexity of their vocal repertoires, at least with respect to calls. These guys also seem to have more complex social structures, as is usually the case within habitually ant-following species. So, I think there is just too much diversity to lump everything into a big Pyriglena, and I have similar objections to Option 3, which would also be less internally cohesive than Option 5, due to similarities of Gymnocichla and Pyriglena to some members of what would be a diverse and expanded Percnostola. I think it comes down to either lumping everything into one genus (Pyriglena), which would be the most inclusive but also the most diverse and poorly defined option, or, split into multiple genera as suggested by Isler et al. (2013), and live with a bunch of small genera, a couple of which are weakly supported. Somewhat subjectively, I’m more comfortable with the latter approach, especially given how the resulting genera would relate to other long-recognized generic divisions within the Thamnophilidae.